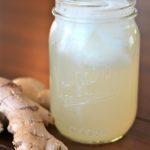 This Homemade Ginger Ale recipe is really delicious and also a fantastic natural remedy. This information should not replace professional advice by a qualified medical or herbal practitioner. If you love Ginger Ale, know that you can make your own at home without any artificial ingredients and preservatives. Yes, a healthy and all natural recipe that can also be a natural remedy. 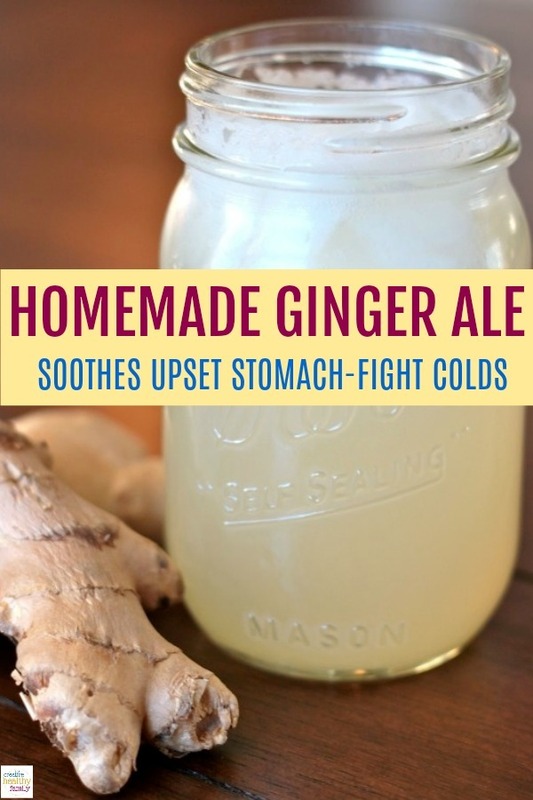 This Homemade Ginger Ale is delicious and also a great way to help prevent and fight a cold or the flu. Ginger has amazing health benefits and it is so good for your health. Make sure you buy fresh ginger and you drink your homemade ginger ale right away to get all the wonderful properties. When I was pregnant, this drink was perfect when I had nausea. It also soothes an upset stomach and may reduce muscle pain and soreness because of its anti-inflammatory properties. Ginger is an herb. The rhizome (underground stem) is used as a spice and also as a medicine. It can be used fresh, dried and powdered, or as a juice or oil. Ginger can help treat the common cold, flu-like symptoms, headaches, and painful menstrual periods. Ginger has a very potent anti-viral substance that prevents the adhesion of viruses to the upper respiratory mucosa. It is anti-inflammatory, antiseptic (preventing the growth of disease) and also an antioxidant. Ginger also soothes the stomach and throat, has properties to suppress a cough, and is considered a natural pain and fever reducer. If you make hot Ginger Tea , you can breath in the hot elixir and help clear your nasal passages. I am a huge believer in natural remedies and nutrition. This is the reason why I am always looking for more natural ways to treat common health problems. This homemade ginger ale makes me feel so much better when my stomach is upset. I used to drink it everyday when I was pregnant. Ginger is also great for colds because it has anti-inflammatory properties that will help relieve a sore throat quickly, and it will also kill rhinoviruses, the viruses that actually caused the cold in the first place. Are you fighting a cold? Check out my Detox Bath post. A great natural way to boost the immune system and fight a cold FAST! It really works for my family and I highly recommend it. Please remember that this information should not replace professional medical advice. It is always a good idea to talk to your doctor before trying any natural remedies. 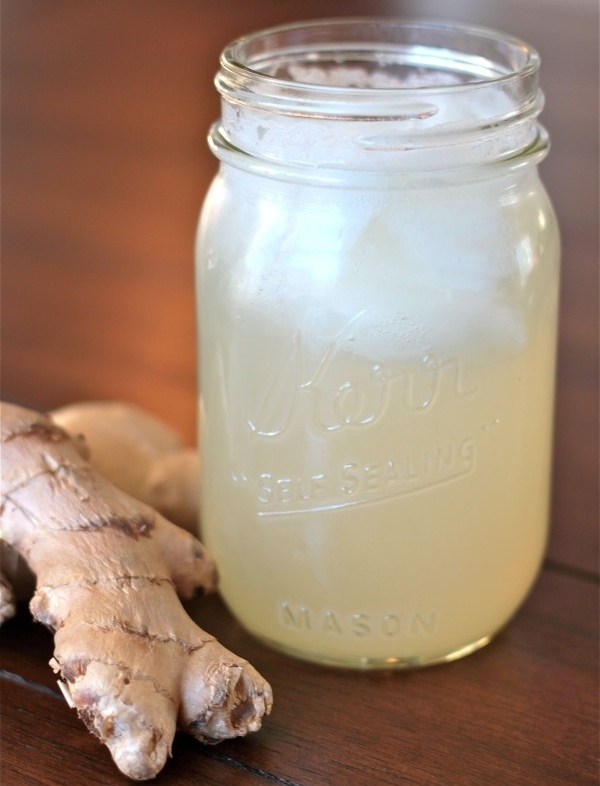 A super easy healthy homemade Ginger Ale recipe. Perfect for nausea, soothe an upset stomach, and fight colds. Juicing Method: First you need to juice the ginger and lemon. Then, mix well well with the sparking or carbonated water, and honey. Blending Method: Grate the ginger and squeeze 1/2 lemon. Then blend all the ingredients together and pour through a fine strainer. Drink it up and Enjoy! You can add 1 inch of peeled fresh turmeric and incorporate it to your ginger ale recipe and turn it into a wellness shot! Turmeric is really great for fighting inflammation and boosting the immune system. Either method will work fine (blending or juicing with the rest of the ingredients). Use a pinch of cayenne pepper to help clear any congestion you might have if you are dealing with a cold. The lemon, ginger and cayenne combination will give you lots of energy! I recommend starting with just one inch of fresh ginger and work up your way to 2 inches or desired taste. Ginger has a very strong taste. Use more or less honey according to taste. Remember the benefits of eating Pure Natural Raw Honey are simply amazing. Buying raw honey is really important! How does one juice a piece of ginger root? You need a juicer. Also figuring out other ways to get ginger juice. Will update the post soon. Thanks. For its easy to get ginger juice. Just smash it many times inside a clean plastic bag, and than mix with lemon juice and all ingredients stir well and strain it. Enjoy your home made ginger ale. How would you do this recipe if you don’t have a juicer? Hi, many people are asking the same question. I will try and find other ways and will update the post soon. Thanks. Not a stupid question at all. You need a juicer. I am also trying to find other ways without having to use one. I will update the post soon. Thanks. I don’t have a juicer. Is there another way to juice ginger? I’d love to try this! I am trying to figure out other ways to get ginger juice. Stay tuned for an update very soon. I grew up in the Detroit area in the 60’s drinking ginger ale (Vernors 😊) believing that it cured all sorts of ails. As an adult, I know the soda/pop available today is not what they meant! My question is, do you need a true juicer or can you use a strong blender like a vitamix? Thank you for comment. The best way is really juicing the ginger. I am going to do some research and explore other possibilities. I will soon add them to my post. Thanks. You should explain how to juice ginger. I had to go look it up elsewhere. Good idea though! Sorry about that. I will edit the post and add a description for it. Thanks for the suggestion. How do you juice ginger? I don’t own a juicer machine. The best way is really to juice the ginger but if you don’t have a juicer you can buy ginger juice at a health supermarket. Hope this helps! Can someone with adrenal fatigue drink this? I find that if I eat ginger I get terrible herx reaction – like strong detox…. I cant tolerate alcohol but this drink seems to be herbal? I have never tried ale before….although being in the UK theres load all around me…. I don’t see why not but if you have a negative reaction to ginger you might want to try just a little bit first and see how it goes. I have been making this for my husband and I every day, for the past week. I simmer the lemon and ginger in a small amount of water, cool, then add the honey and carbonated water. We have been able to drink this as a substitute for commercial ginger ale. The time period of my cold was shorter than usual during this same week. We love it. So happy to know that it is working for you and your husband. I am a huge believer in natural remedies and nutrition and this is proof. Thanks for sharing! thanks for sharing. it would be so useful. and very match with the changing climate. Hope it good for all ages. Thank you for your comment. Yes, it is good for all ages. 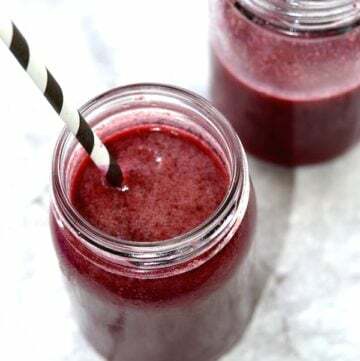 Is there a way to make this without a juicer? Hi, the best way is really with a juicer but if you don’t have one you can buy juiced ginger at a supermarket. Hope this helps! Even if one owns a juicer, it’s kind of silly to dirty it up for such a small piece of ginger. I’ve grated ginger before. I’ve even put small pieces in my garlic press. I would not suggest doing this as ginger juice explodes everywhere causing a great mess! Anyway, since I’ve seen soooo many folks ask how one can juice ginger without a juicer I decided to give it a google. So, here ya go my friends: https://www.thespruceeats.com/how-to-make-ginger-juice-695297 In case you can’t click the link I just added, simply copy and paste it in a new window. I hope this helps. I’m currently making a ginger bug (fermenting) to make natural ginger ale. You may want to grate the ginger and get the juice from it…am a domestic helper and that is what i do whenever i ginger juice for marination. Dont think you have to juice the lemon and ginger. You can slice the lemon thinly, grate the ginger, add honey and store in a jar in refrigerator. Then add a tablespoon or two to bottom of tall glass, add ice and add sparkling water or plain water. Has anyone tried water bath or pressure canning the ginger ale in this recipe? I haven’t but I’m curious to know…..
Hi all. To have ginger juice it’s easy. Put ginger as you need in zip lock bag and smash it, then take it out and mix well with all ingredients including lemon juice. Strain it and enjoy your home made ginger ale.